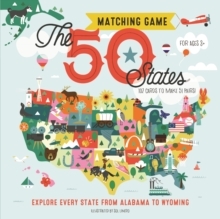 Learn about the fun and fascinating 50 American states with this 7" x 9" memory game. Printed on heavy laminated card-stock for display and play, these cards feature the state and flag of a state on one side and a list of factoids and trivia questions on the other. This fun an interactive way of teaching children about the 50 United States will inspire and entertain with its beautifully-designed presentation of the many different faces of the American states.